The run up to Christmas is such a busy time for all of us, organising the family or friends' visit, pre-ordering the turkey, planning the menus, searching for the perfect presents and of course decorating the house to transform one's home into a warm and welcoming festive paradise. 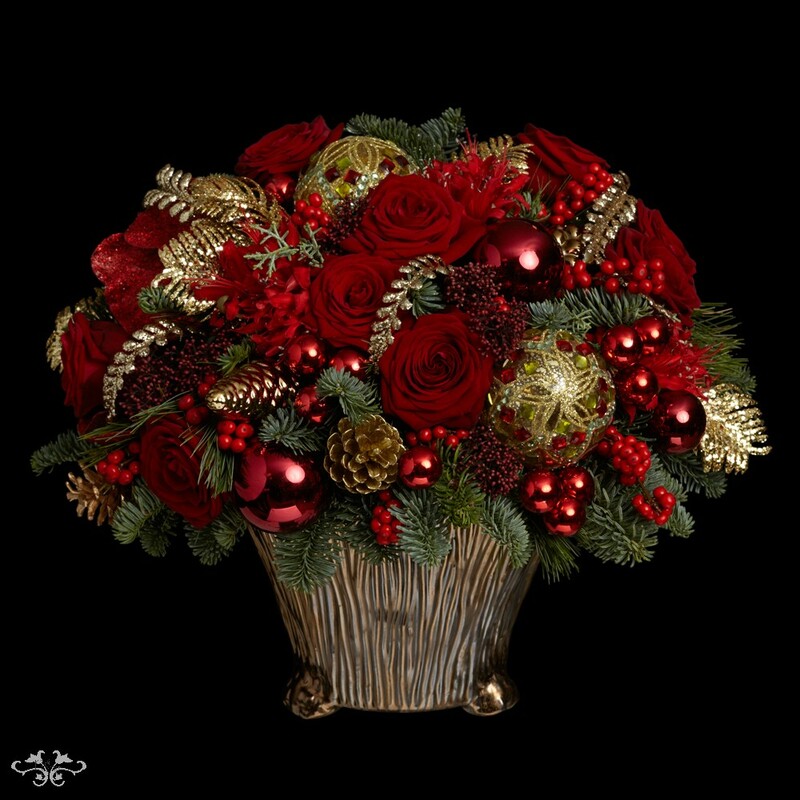 With this in mind, to facilitate the decorating, we have launched for the first time an online ordering service for our clients to choose their Christmas door wreath and festive bouquets and floral arrangements comprising cut flower designs and planters lavishly dressed for the season. To give clients ample choice of styles and colour themes, we have designed 10 different luxury wreaths with varying options of ribbons and accessories. Colours range from traditional reds, frosty whites, chocolate browns and copper, to the new in vogue coral, plummy purples, peacock blue/turquoise and even a striking black and silver. Neill Strain Floral Couture Super Deluxe wreath "Nutcracker"
Neill Strain Floral Couture Super Deluxe Wreath "Snowflake"
Neill Strain Floral Couture Super Deluxe wreath "Chocolate Box"
Neill Strain Floral Couture Super Deluxe wreath "Christmas Coral"
Neill Strain Floral Couture Super Deluxe wreath "Sugar Plum"
Neill Strain Floral Couture Super Deluxe wreath "Winter Waltz"
Neill Strain Floral Couture Super Deluxe wreath "Silent Night"
Neill Strain Floral Couture Super Deluxe wreath "Wonderland"
All of our stunning door wreaths are carefully packaged in an especially designed, impressive box to facilitate nationwide delivery across the U.K.
Neill Strain Floral Couture luxury door wreaths are packaged in a box for delivery nationwide. For decorating your interiors, we have two ranges of designs, one in a traditional red and gold and the other in frosty whites. 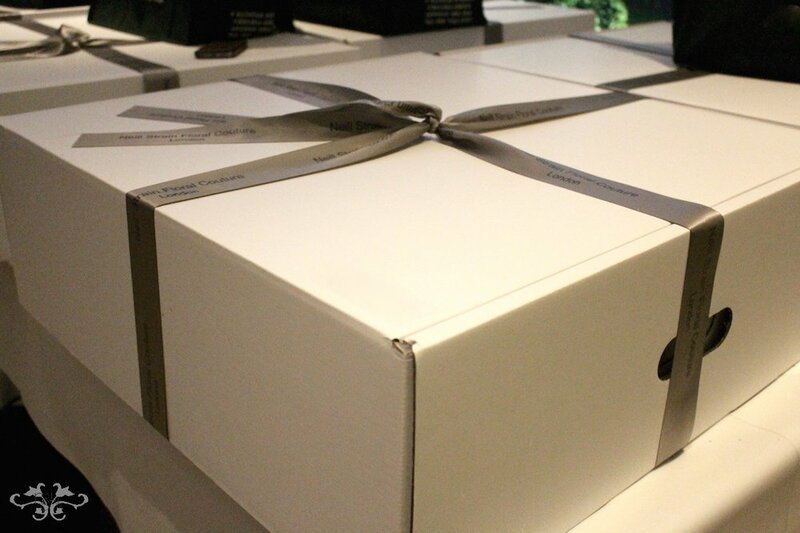 Each range includes a hand-tied bouquet, various low table arrangements (with candles), very tall arrangements designed to dress an entrance hall or drawing room with high ceilings and our Petite Couture arrangements which make a delightful gift. 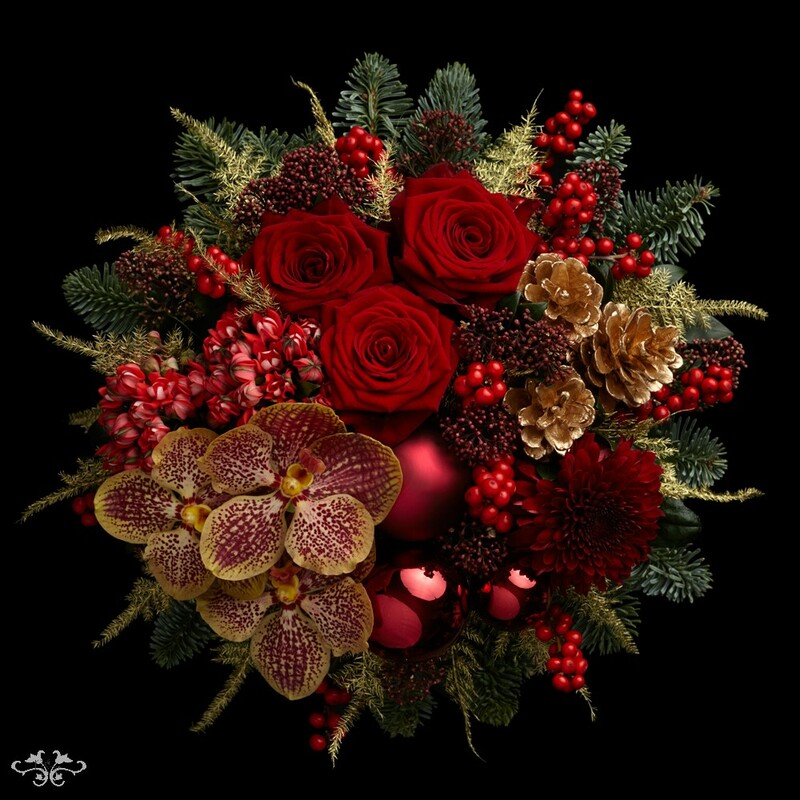 The "Red Rejoice" range includes everything I love about a traditional Christmas: stunning red Naomi Roses, berries and pine, gold and red baubles, Vanda Orchids "Sunanda Retro Red," Calla Lilies and gold-sprayed fern. This "White Christmas" range I think is quite spectacular. 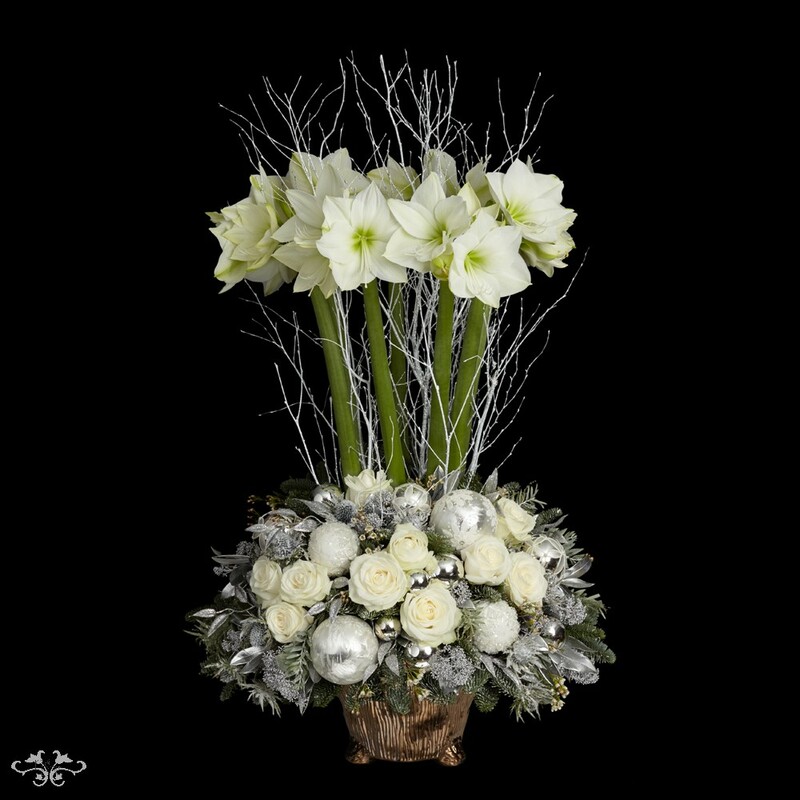 The tall Amaryllis design is an absolute show stopper reaching a height of one meter. 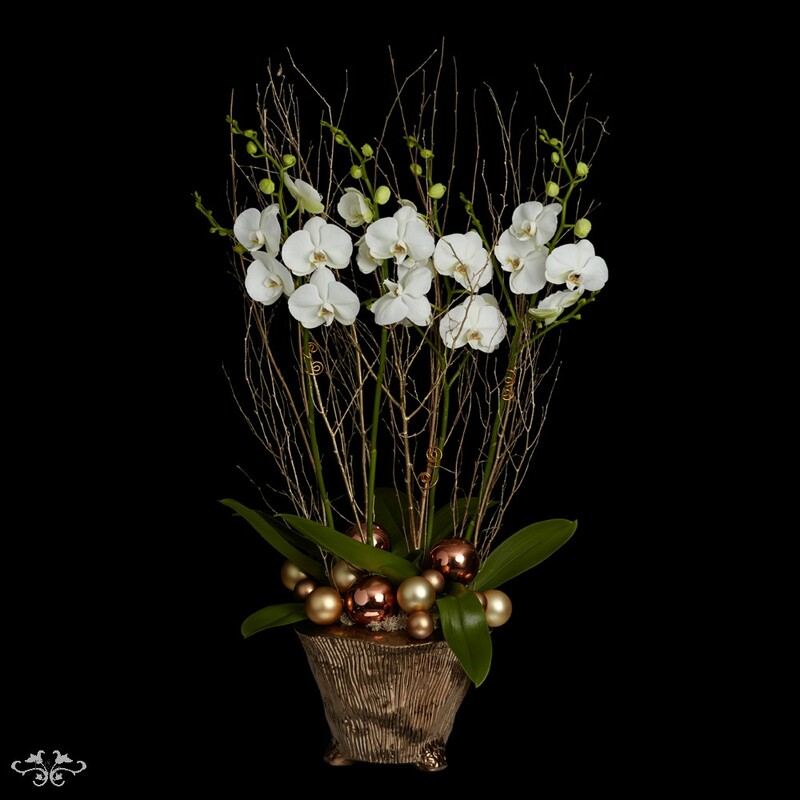 The soft blend of Roses, white Vanda Orchids, Calla Lilies, silver baubles and silver-sprayed pine and foliage creates designs of great elegance yet truly festive. 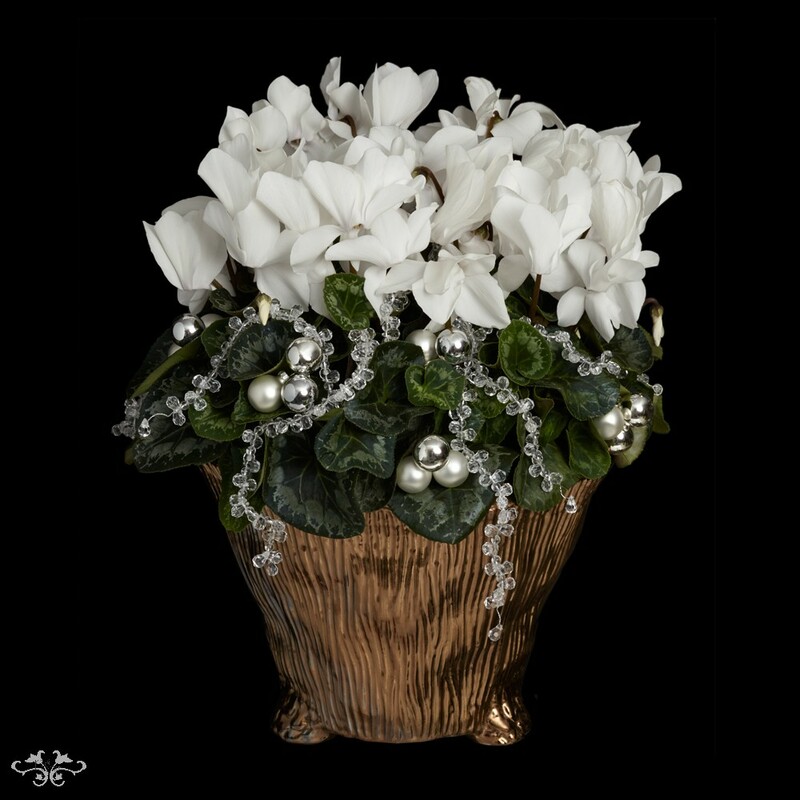 And for those plant lovers, we have dressed Orchid, Cyclamen and Amaryllis plants for the season with baubles and garlands. I hope all these images of our work have inspired you to start decorating your home - Christmas is only a month away! If you wish to order any of the designs, we trust you will find our online ordering service easy to use. If you have any problems don't hesitate to call us at the boutique on: 020 7235 6469. And if you prefer to pop into the boutique or the Harrods concession, we have lots more designs to tempt you with, or let us make up something completely bespoke just for you. In the meantime, enjoy your preparations for Christmas!